Something very basic that we all should cook frequently because you can usually get more than one meal from it and it is economical. The problem is that sometimes we overcook the chicken or get a greasy mess. The trick to a great roasted chicken is to place a wire rack in the bottom of the roasting pan and place the chicken on top of the rack. The other key is to season the chicken well and not to overcook the chicken. I know we are all afraid of undercooked chicken so what do we do? 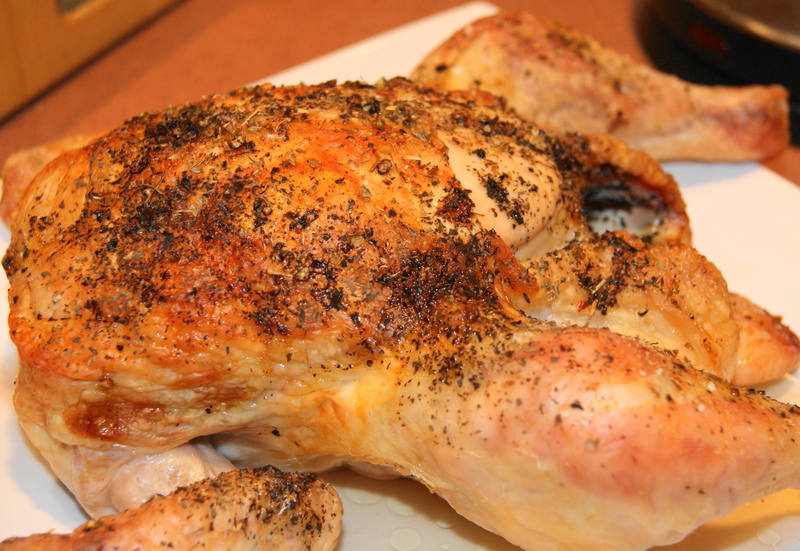 Get a good oven thermometer so you can tell the temperature of your roasted chicken. Rub olive oil all over the roast chicken. Put butter under the skin on both sides of the breast. Season the roast chicken with onion, garlic, salt, pepper, oregano, basil, and red pepper flakes to taste. Put the tops of the green onions into the cavity of the chicken. Place in a 375 oven and roast for 1 hour and 15 minutes. Keep an eye on your oven thermometer to make sure you don’t overcook the chicken. Remove from the oven and let the chicken rest for at least 15 minutes before carving.